Well bloody hell, November already? was July really the last time I posted on here? Yikes. I really need to take a little WCF time out here and there a little more regularly. While I may not post a lot on here, I do still do a lot of painting and gaming (I really hate the term “hobbying” which seems to be the term that GW have made their own). I haven’t picked up a Space Marine in forever, and strangely I haven’t missed it one bit. Instead, I raided the ‘drawers of shame’* and pulled out some miniatures that thought they would never see a bristle or a drop of paint. First up? Cybermen! Classic Tom Baker era Cybermen from Blacktree Miniatures. They’re sort of whimsical, and charming in their own way. The proportions are a little off, but they only took literally minutes to paint. I think the bases took longer! I have some more to do, including some later era (from about the time of Earthshock/Silver Nemesis) which will be getting the treatment shortly. I have a bunch of the metal Daleks to paint up as well. I’m thinking of incorporating them into my Judge Dredd game as illegal alien entities. Might be fun to have the judges of Mega City One square off against Daleks and Cybermen! I’ve also picked up some new units for my late war British forces for Flames of War, a Commando Platoon and an accompanying mortar platoon. No paint on those yet, but I’ll have another update soon (promise!). I’ve been having a lot of fun just picking random miniatures to paint, it’s bought a little of the excitement back, unlike looking at ranks and ranks of >insert your pain point of choice here< and thinking AARGH! I also recently picked up a Keeper rulebook for Call of Cthulhu too, and have been devouring the contents ever since. I’m going to have my first game very soon. I’ve never been a GM/Keeper before, so this should be interesting… gulp! *Drawers of Shame – draw with unpainted miniatures. Not an underwear drawer with speedos in. Author PaulPosted on November 8, 2016 November 8, 2016 Categories Miniature painting and techniques, UncategorizedTags 2000AD, 7th Doctor, Call of Cthulhu, Chronoscope, Cybermen, Daleks, Doctor Who, Flames of War, Halloween, Judge Dredd, Lord Chaos Creations, Reaper Miniatures, Sylvester McCoy, TARDISLeave a comment on Slap some paint on! Flames of War… the 15mm wargame set in the World War 2 era. Dethtron started getting interested in this a while back, and his infectious enthusiasm was hard to ignore. He’d already decided on playing the (later war) German forces (Achtung! ), and well, with me being a Brit, who else would I play? Of course! the Russians! Only joking :). I had to fly the flag for my country and opted to play the Tommys. I haven’t really had much time to get the ball rolling with this, although I have played a few games (playing the American forces) and it is super enjoyable. I have managed to knock out a bunch of rifle platoon stands, but I just finished the first of eight artillery pieces, which i’m quite pleased with. The satisfying thing about painting FoW, is that it happens so quickly. I basecoat everything and simply slap a wash over it, apply some matt varnish, and done! 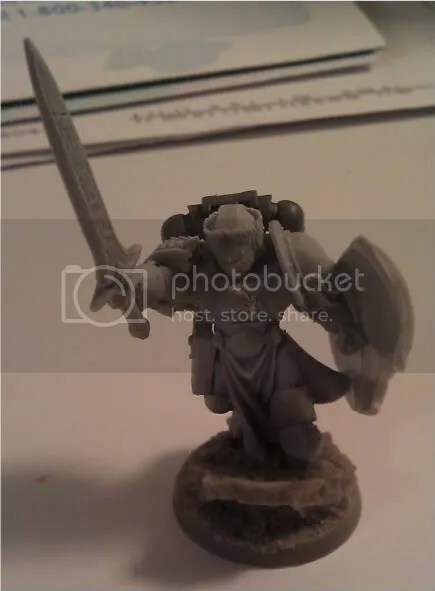 I’ve seen people really go to town highlighting 15mm minis, and while it’s an art unto itself, I feel it can sometimes ‘drown’ the miniature. Keep it simple, less is more. Now that i’ve found a ‘groove’ with painting this stuff, I hope to be able to rattle out the rest in double quick time so I can keep those bleedin’ Germans occupied! Mind blowingly unproductive! yes! that’s me! Although I haven’t been committing brush to miniature, I have been constructing. I based up a bunch of my Flames of War chaps on some sweet scenic bases that Gale Force 9 recently put out. 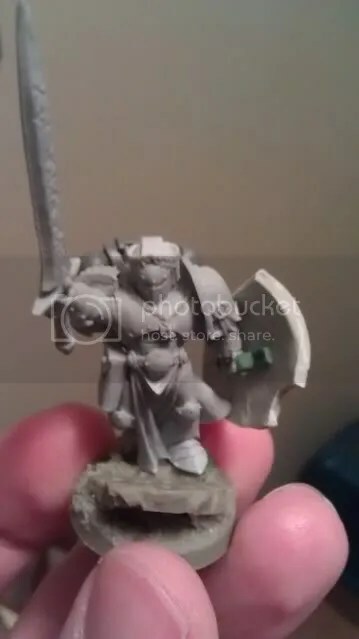 I also assembled my Wolf Priest for my fledgling Space Wolves force and I also picked up the Finecast Emperors Champion, which I felt needed a little extra ‘something’. I lucked out again, as it seems that this mini had no issues in the quality control area, so assembly was a snap (and thankfully nothing snapped). I decided to put him on a scenic base, rather than a standard one and add sand. I dug around in my bits drawer and found a MicroArt Studios base which I thought would do the trick nicely. 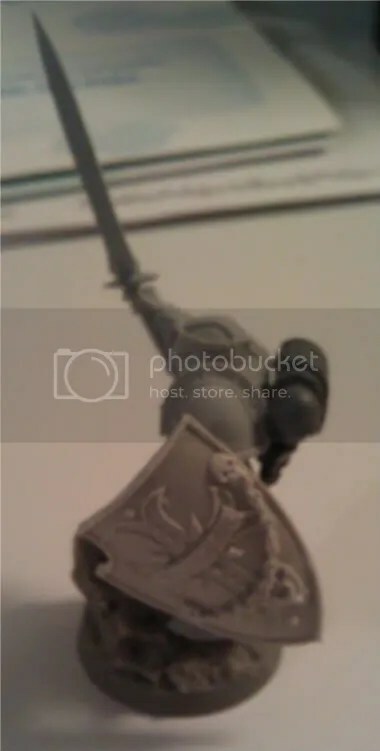 I pinned him to the base, putting a little hint of an angle in there to hopefully give the image of movement. He is stepping forward and I wanted it to look as though he was going to step over the piece of ruin on the base. Author PaulPosted on September 16, 2011 September 16, 2011 Categories GeneralTags Black Library, Black Templars, Blood Angels, Chaos Space Marines, Emperors Champion, Flames of War, Micro Art Studios, Scibor, Space Marines, Warhammer 40 000, Xbox7 Comments on Mind blowingly unproductive! yes! that’s me!